CJ Logistics has been selected as the most admired company in Korea for six consecutive years since 2013. CJ Logistics (CEO Park Geun-tae) announced on February 27 that, once again, it continues to be ranked No. 1 as the ‘Most Admired Company in Korea’ and has done so for the past six years in integrated logistics service for 2018 by Korea Management Association Consulting (KMAC). The ‘Most Admired Company in Korea’ by KMAC was first selected in 2004 and marks the 15th year as of 2018, intended to define a desirable role of companies that can properly perceive corporate social and economic responsibilities and gain trust and respect by evaluating six core values such as innovation capacity, shareholder value, employee value, customer value, social value and image value. 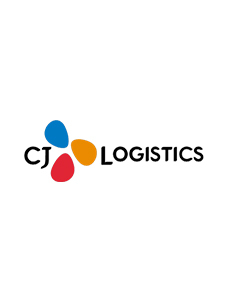 CJ Logistics was valued highly for contributing to the national economy and industrial development, and enhancement of convenience in life with their strengths in logistics as an integrated logistics company that leads its respective industry in Korea. CJ Logistics delivered 1.05 billion boxes in one year in 2017. This means that citizens aged 15 or older (43.85 million) received 24 deliveries by CJ Logistics a year, indicating that logistics service has become an essential business for the public interest in our society, deeply penetrating into the lives and culture of people in Korea. This is the first in the history of the Korean logistics industry for a single company to exceed 1 billion boxes in annual volume. CJ Logistics is installing automatic ‘wheel sorters’ in over 170 sub-terminals nationwide to stably handle the volume that continues to increase every year. Implementing wheel sorters reduces the workload of delivery personnel and increases their income, while also promoting delivery efficiency. This also created an environment to meet diverse customer needs and maximize satisfaction with service. Moreover, CJ Logistics is undertaking various efforts to fulfill the three core values of creating jobs, achieving eco-friendliness and contributing to the community based on the management philosophy CSV (Creating Shared Value) set by CJ Group Chairman Lee Jay-Hyun, and also to become one of the top 5 global logistics company by 2020. 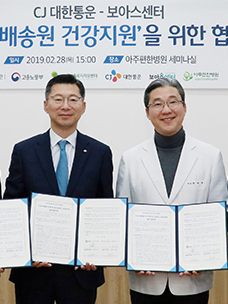 CJ Logistics is also operating the Silver Delivery Service with over 1,300 senior citizens and 160 bases nationwide such as Seoul, Busan and Gyeongnam. The Silver Delivery Service is a business model in which the delivery vehicle brings the parcels to the apartment complex and the senior citizens use eco-friendly equipment to deliver the parcels to each household. This has the benefit of not emitting any greenhouse gases while also creating jobs for senior citizens, thereby vitalizing the regional economy. CJ Logistics also won the 2nd and 4th Porter Prize for Excellence in CSV in terms of project effectiveness for their contributions to creating shared value. Last year, the company was ranked among Fortune’s Change the World list by the world-renowned economic magazine of the same name, which was the first among Korean companies. In addition, CJ Logistics regularly provides delivery service for the disabled and persons of national merit, and also takes the initiative in contributing to society by annually donating blood donor cards for children with cancer as collected by employees. The company also planted and nurtured a forest in the middle of the city to help reduce greenhouse gas levels by absorbing carbon while improving the residential environment in the city. 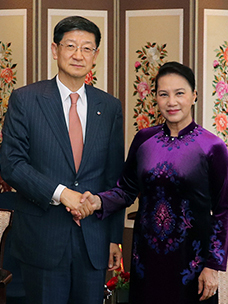 CJ Group Chairman Kyung-shik Sohn and Croatian Parliament Deputy Speaker Meet.